Many people have the same experience of deleting or losing emails, including Outlook emails and folders. This article defines the types of deleting Outlook emails and its folders and tell you how to recover permanently deleted emails from Outlook on Mac, including Outlook 2016, 2013, 2010, 2007, 2003 and 2002. You can try the following ways to recover Outlook messages, calendars, tasks, contacts, etc. Choose the right way to recover deleted email files and folders in Outlook on Mac. Let’s start. First, let’s get a little knowledge of Outlook email deletion. Only after you realize which type of deletion you’ve carried out, then you can recover the deleted Outlook emails on Mac easily. Soft Deletion: it means you only removed the Outlook emails from the formal folder from where you’ve received or categorized it. Generally speaking, you selected it and click the "Delete" button within Outlook, or drag and drop the email to the trash folder. Hard Deletion: it means you selected the Outlook email on Mac and carried out the deletion with the "Command" + "Delete" button. Permanently Deletion: it means you’ve deleted the Outlook data file with either the .ost or .pst extension. Second, after you realize how you deleted Outlook emails on Mac, you need to choose the right tutorial for how to recover deleted Outlook emails on Mac. If you’ve deleted the Outlook emails on Mac with the soft deletion, you just need to remove the deleted emails out of the trash folder on Mac. Here are the steps. Step 1. Launch Outlook, find the email folder list first. Then click the Deleted Items/Trash. All deleted emails in soft deletion way are there. Step 2. No matter what types of files you’ve deleted, you can see all of them in the folder. The way to recover them is simple. Select the email and right-click it, select "Move" > "Other Folder" > put it in the right category. Step 1. Launch Outlook, go to email folder list to click Deleted Items. Step 2. 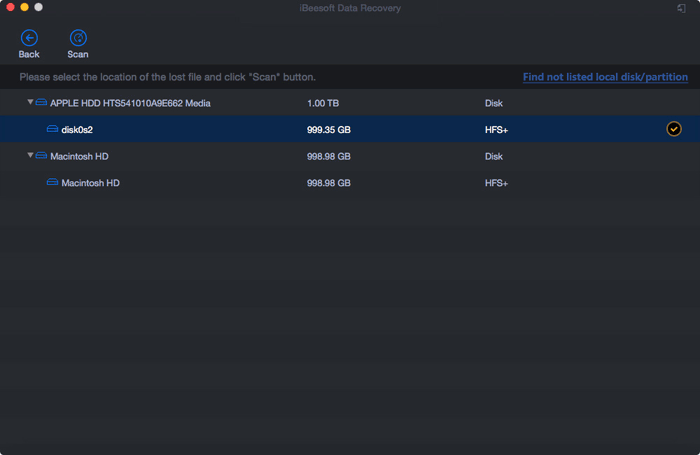 Select the Home, and then click Recover Deleted Items From Server. Step 3. Select the deleted items you want to recover, click Restore Selected Items, and then click OK.
It’s the only option Microsoft offers for users to recover deleted permanently deleted emails in Outlook on Mac. This way is the most powerful and easiest way to recover permanently deleted emails of Outlook on Mac. Here are the ways for how to use it. 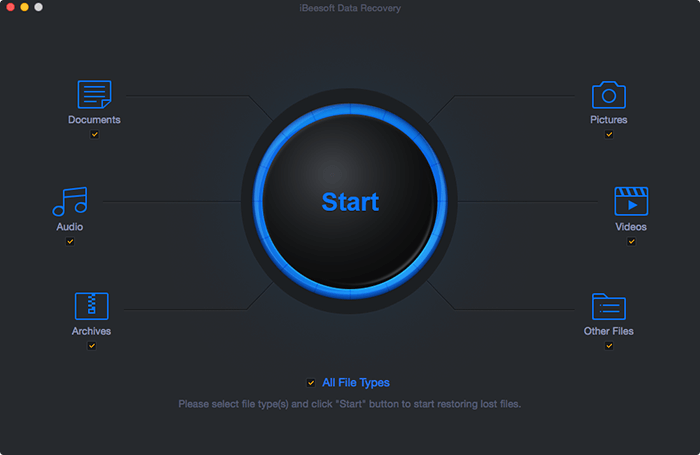 Click the download button to get the installation package of iBeesoft Data Recovery for Mac. The software is virus free and thousands of people using it. It can help you easily and completely recover deleted files on Mac or other storage device and unformat drives such as hard disk/volume, SD card, USB drive, digital camera etc. Install it on your computer like the way you install other software. Launch the Outlook email recovery software. From the first window, please check "Other Files". it means it will not scan for the unchecked file types, saving you time for the scanning process. Click "Start" to recover deleted Outlook emails on Mac. In the next window, all partitions on your Mac are listed. Please select from which one your Outlook emails are deleted. Select it and click "Scan" to let the software scan for the deleted email on Mac. It takes a few minutes for the software to scan for the deleted Outlook emails on Mac. After then, you can see the result when it finished. Select a file, you can preview it. 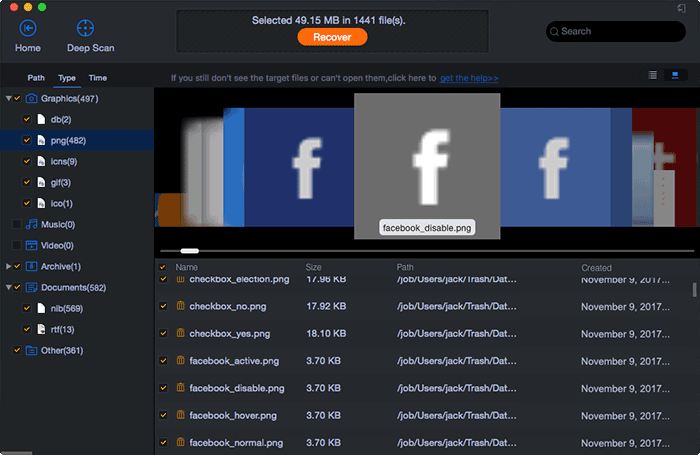 If it is the file you’re looking for, then click "Recover" to save it on your computer. Please save the files with the .ost or .pst extension to the original folder, letting Outlook arrange them.